Matt Derry secured his first notable victory under the Maver banner after topping this year’s Gloucester Canal Championship. The event, which attracts some of the best canal anglers in the country, saw over seventy (70) anglers go head to head for a reasonable prize pot and trophy. Matt had been in great form leading up to the event framing in a number of the Official CIPs rules practice matches held on the venue in the build up to this year’s Sensas Canal Challenge, also held on the Gloucester canal, so was confident going into the match. 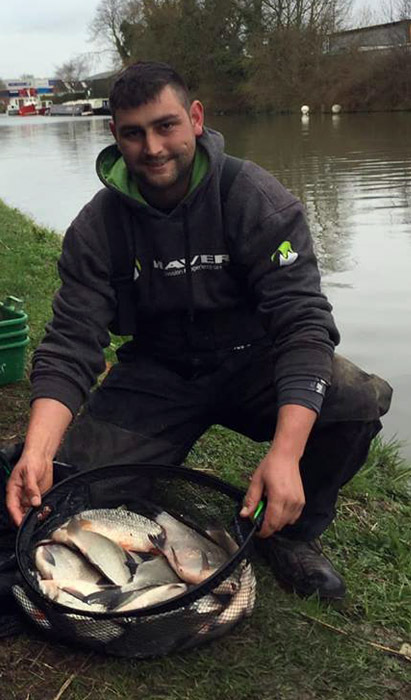 Below, Matt reflects on his Gloucester Canal Championship victory on what is regarded by many as one of the most challenging venues in the country. “This year’s Gloucester Canal Championship was attended by a strong 70-odd anglers. The canal has been in good form with large numbers of skimmers feeding well in the weeks leading up to the Championship with the water maintaining a perfect colour, which is often key“. “I drew end peg 24, which I was happy with. It’s a very steady area and one I have fished many times before, but I’d never been on it as an end peg before“. “I set up my stall for the day to target the resident bream and skimmers on both the feeder and long pole. I opted to set up one of the brand new Signature 10′ 6″ bomb / feeder rods – perfect for this style of fishing being crisp on the cast and smooth on the strike”. “I also set up the pole at 13m where I used Signature series 3 floats in 1g and 1.5g to 0.10mm mainline. With this, I used an Italian shotting pattern to an 0.08mm hooklength and, at the business end, a size 18 hook“. “I started the match balling in five litres of groundbait and cupped in over the top throughout the match with balls of leam overflowing with joker and pinkie. I ended the match with over 20lbs of skimmers and one huge roach and a match win“. “I was absolutely made up to win the event for a third time, especially with my new sponsor, Maver (UK). Well done to all that fished this great competition on, what I think, is one of the most challenging venues in the country“. “Finally, a big well done to the match organisers for putting on what was another great competition. Roll on next year“. Matt will return to the venue on 30th – 31st March for the annual Sensas Canal Challenge – an event he has won twice before and will be looking to complete the hat-trick.